* The grey quill is also handmade in France & Germany and it is equally as important as the brown as an essential brush for the sign painter. * The series 189 or 189L is a universal lettering brush. * The grey hair has more snap than the brown. * It is used for general commercial work such as signs, truck lettering, boats, etc. 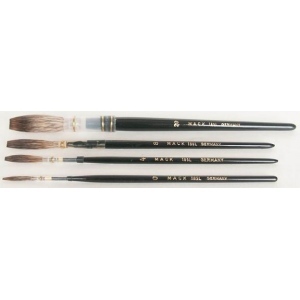 * The grey hair is more durable than the brown, and this brush is suitable for lettering on most surfaces.